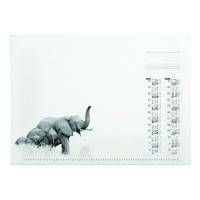 Run out of sheets for your Durable calendar desk mat? This replacement desk pad has an African wildlife design with a two year block calendar and space for taking notes, ideal for keeping your desk tidy. Keep the same design or try out a new one.